The U.S. gets an understated $9K special paint job. 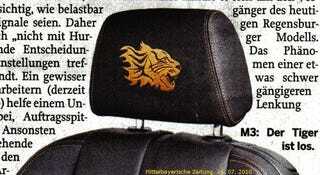 China getts a crazy orange M3 Tiger Edition with headrests pulled from the jacket of an extra in Big Trouble In Little China. BMW's confirmed it's real and shared specs. Here's a pic of the car via m3Post.